From a January 1989 lecture. ...Either after the initiation session in Section III of The Avatar® Course, or somewhere on the Section IV Master Course, a student begins to discover his or her own patterns of creation. It is quite a remarkable discovery and opens a very private and personal door to the templates of one's own existence. This is the path that awaits beyond the Avatar materials; it goes beyond Star's Edge, and there are no maps and no footprints to follow. The final instruction, the last guidepost before the gate, which will appear to some as the blessing of source and to others as the curse of blame, says simply, "YOU are a more fundamental reality than any aspect the world can reflect!" At this threshold, the uninitiated turn back to the world to "logic for explanations" and seek "reasons why." 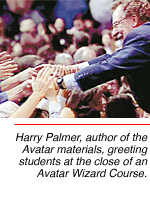 But the trained Avatar student will pass beyond any need of instruction and directly experience the inexpressible that gives rise to the patterns that shape his or her existence. This plateau of awareness is quite a relief for the sincere seeker of enlightenment. From it, one sees how the actions and events of his or her life align with a higher consciousness desire to explore life's potential. It is with a mixture of amusement and amazement that one recognizes the incredible conservation of effort behind every life's event and every changing moment to offer the perfect lesson for unfoldment. The struggles with life, the resistances and fixed ideas, are replaced by a willingness to experience and a natural alignment of one's own efforts with the efforts of a higher universal consciousness. This is undoubtedly what the great Chinese I CHING refers to as being in harmony with the Tao. Without reflection or calculation, one acts in perfect harmony with the template of one's own higher design. At last, there is the feeling that one is where one ought to be! There are no unpaid obligations, no accounts due. It is an end to the struggle between self and the world. Beyond this is the final fulfillment of the deep, haunting desire to again exist as unity. It is the inseparable that one truly is, the no-boundary space that hosts the circus of life and death. It is the infectious gleam of joy in your own eye reflected in the Avatar Master's eye. It is source awareness. YOU are a more fundamental reality than any aspect the world can reflect! An Avatar Master understands that beyond the lessons he can teach awaits a private and personal world path that only the self-honesty of his student can reveal. He does not burden nor comfort the student with his own or others' belief systems. He does not delay the student with hidden fees in the form of worship, homage, enforced loyalties to a cause or enforce agreement with a creation. He asks for some form of currency for his service and nothing more. The Avatar Master equips; the Avatar Master trains; the Avatar Master points; but then, the Avatar Master moves aside. It is this ability of the Avatar Master to know when at last to step aside that makes the Avatar training so powerfully liberating. All content copyright 2018, Star’s Edge, Inc. EPC is a service mark of Star's Edge, Inc. Avatar®, ReSurfacing®, Thoughtstorm®, Love Precious Humanity®, Enlightened Planetary Civilization® and Star’s Edge International® are registered trademarks of Star’s Edge, Inc. All rights reserved.